Per-heat the oven to 350°F and spray a 9" x 13" baking dish. Add 2 Tbsp flour and whisk until smooth. Cook the butter and flour mixture until it's a little dark, 1 to 2 minutes. While whisking, add 1 cup chicken broth and whisk until smooth. Add 1/2 cup cream, 1/4 cup wine, 2 tsp mustard and 2 tsp thyme. Whisk until smooth. Divide the sauce into two bowls. One bowl should have 1/4 cup of sauce. In a medium bowl, toss 1 1/2 cups fresh breadcrumbs with 3 Tbsp melted butter and 1/4 tsp salt. Set aside. Pound the chicken breasts to an even 1 inch thickness. Pat the chicken breasts dry with a paper towel. 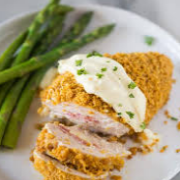 Lightly brush the tops of the chicken breasts with the Dijon Cream Sauce. In a small bowl, combine 1/4 cup chicken broth, 1/4 cup white wine and 1 tsp fresh thyme leaves. Tuck the butter pieces between the chicken breasts and inside edge of dish. Cover the chicken with foil and bake it in a 350°F oven for 15 minutes. Remove from the oven and sprinkle the chicken with the breadcrumb topping. Or until a meat thermometer reads 160°F when stuck in a chicken breast.